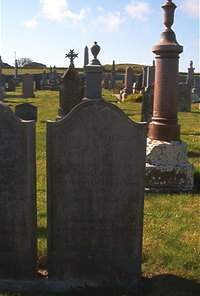 Janet Sutherland died 3rd December 1825 aged 62 wife of Alexander Cormack farmer of Overtown Mid Clyth. John Cormack crofter of Newlands died at Swiney 10th March 1923 aged 83. Wife Catherine Sinclair died 16th October 1924 aged 84.